There's satay, and then there's real satay. 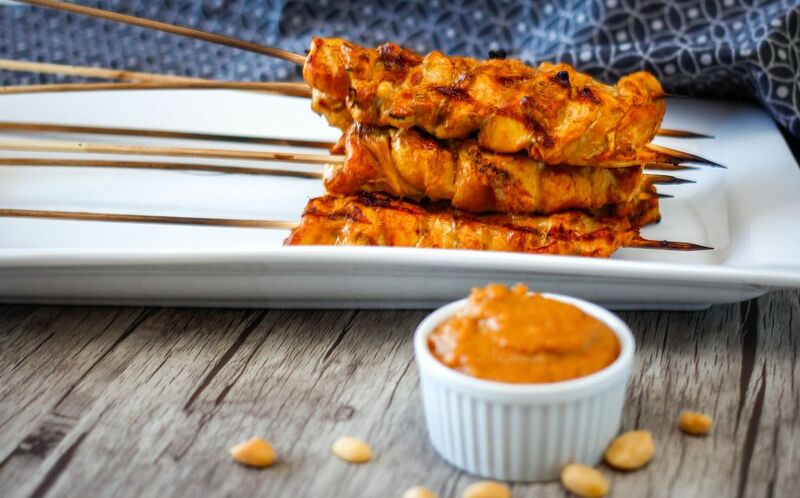 If you've never had the real stuff, then you'll fall in love with the succulent taste of this special Thai satay recipe. Strips of chicken or beef are marinated in a special Thai paste -- unless you go with the vegetarian version -- then skewered and grilled or broiled in the oven. It is then served with homemade peanut sauce for the ultimate taste sensation. Satay makes a great party food and the kids will love it. Make the marinade by placing the lemongrass, shallots, garlic, chiles, galangal or ginger, turmeric, coriander, cumin, soy sauce, fish sauce, brown sugar, and oil in a food processor or chopper. Process well. Taste-test the marinade. You should taste sweet, spicy, and salty. In order for the satay to taste its best, the strongest flavors should be sweet and salty. Add more sugar or more fish sauce (in place of salt) to adjust the taste. You also can add more chile if you want it spicier. Cut beef or chicken into small pieces or strips—thinner is better. Place in a bowl and pour the marinade over. Stir well to combine. Allow at least 2 hours for marinating, or longer (up to 24 hours). When ready to cook, thread meat onto the skewers. Fill up to 3/4 of the skewer, leaving the lower half empty so that the person grilling has a "handle" to easily turn the satay. Grill the satay, basting the first time you turn it with a little of the leftover marinade from the bowl. Depending on how thin your meat is, the satay should be done in 10 to 20 minutes. Serve with Thai jasmine rice and Thai peanut sauce for dipping. For extra special occasions, serve with Thai coconut rice. If using wooden skewers, make sure to soak them before you thread the chicken on them and barbecue. Soaking will ensure that the skewers don't catch fire and burn. To soak the skewers, place them in a container large enough to hold them. Cover with water and let soak for at least 20 minutes, and up to 4 hours. Drain well, thread on the chicken, and grill. Are You a Thai Food Lover? What Is Satay?